William Penn Adair Rogers, “Oklahoma’s Favorite Son,” was born on November 4, 1879 at his family’s ranch in present day Oklahoma (becoming the 46th state in the United States in 1907). Rogers was the youngest of eight children of his parents, Clement and Mary Rogers, who were part Cherokee. Precocious, intelligent, and personable, Will fit in well with both the Native Americans and the white settlers he lived around. He [Texas Jack] had a little Wild West aggregation that visited the camps and did a tremendous business. I did some roping and riding, and Jack, who was one of the smartest showmen I ever knew, took a great interest in me. It was he who gave me the idea for my original stage act with my pony. I learned a lot about the show business from him. He could do a bum act with a rope that an ordinary man couldn’t get away with, and make the audience think it was great, so I used to study him by the hour, and from him I learned the great secret of the show business—knowing when to get off. It’s the fellow who knows when to quit that the audience wants more of. Will was so adept with the lasso that he made the Guinness Book of World Records for throwing three lassos at the same time and landing all three throws- one around a horse’s neck, the second around the rider, and the third looping the horse’s four legs together. Rogers never finished school, a decision he always regretted. To fill the gaps in his education, he became an avid reader and enjoyed talking with – and more importantly listening to – people. (“A man only learns by two things, one is reading, and the other is association with smarter people.”) These passions became the building blocks of Will’s humorous observations on everything from everyday life to politics. Eventually, he decided to try his luck on Broadway. In 1916, he made his Broadway debut in “The Wall Street Girl”. It was a great success and Rogers soon expanded to the (silent) screen. With the advent of the talking picture- a better medium for displaying his wit- he became a national phenomenon. His down-home demeanor and folksy humor appealed to the masses who saw Will as one of their own who’d risen from nothing via incredible work ethic to achieve the American Dream. 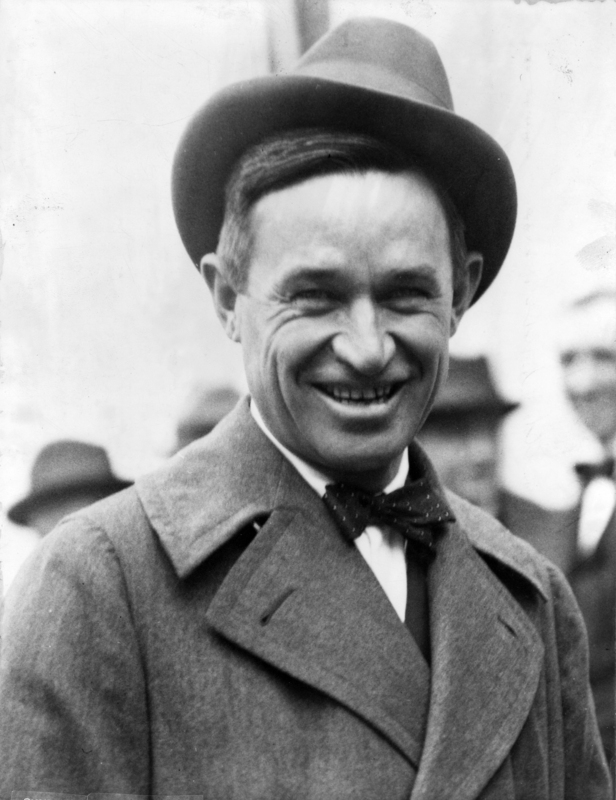 That said, he was good friends with Republican Presidents Calvin Coolidge and Democrat Franklin Roosevelt, so apparently they didn’t mind a bit of good-natured ribbing. He even ran for President in 1928 as a member of his own Anti-Bunk Party, promising that if elected, his first act would be to resign. The mock campaign was used as a platform for illustrating the various absurdities in the way candidates campaigned and in the election process which then, as now, focused more on showmanship than anything else. Despite the time spent on all his other ventures, throughout the early 1930s, Rogers was still a force to be reckoned with in Hollywood, as evidenced by three wildly popular films, Doctor Bull (1933), Judge Priest (1934), and Steamboat Round The Bend (1935). A bit long in the tooth to be playing the young whippersnapper of earlier years, Will now portrayed straight-talking judges or doctors – but with the same, often ad-libbed, witty common-sense and wisdom. In total, he made 50 silent films and 21 “talkies” during his career and was voted Hollywood’s most popular male actor in 1934. Will had another interest that consumed him – aviation. He was already an extensive world traveler thanks to his work as a journalist and performer, but in 1935 he was looking forward to a pleasure trip with aviator Wiley Post, heading to Alaska then on to Russia to explore potential future mail and passenger air routes. Tragically, shortly after landing in bad weather to get their bearings, they took back off only to have their engine fail almost immediately resulting in them crashing in a lagoon near Point Barrow Alaska on August 15, 1935, killing both men. His wife Betty erected a memorial for her husband in his home state of Oklahoma, which was dedicated by President Franklin D. Roosevelt in 1938. Numerous other monuments were also erected, including a statue in the Capitol that is the only one near it that faces the House of Representatives Chamber, so he could “keep an eye on Congress.” Supposedly– so claim Capitol tour guides (with tour guides generally being a great source of wildly inaccurate information)- it is has been a long standing tradition for Presidents to rub the shoe of Rogers’ statue for luck before heading into the chamber to give the State of the Union address. Though gone for eight decades, Rogers’ political witticisms continues to remain relevant (unfortunately in many cases), and he still influences writers and humorists to this day, with shades of Rogers’ act being seen in such entertainers as John Stewart and Stephen Colbert, among numerous others. Will famously stated “When I die, my epitaph, or whatever you call those signs on gravestones, is going to read: ‘I joked about every prominent man of my time, but I never met a man I didn’t like.’ I am so proud of that. I can hardly wait to die so it can be carved.” Yet another feather in his cap is that there were exceptionally few people that didn’t like Will in return.